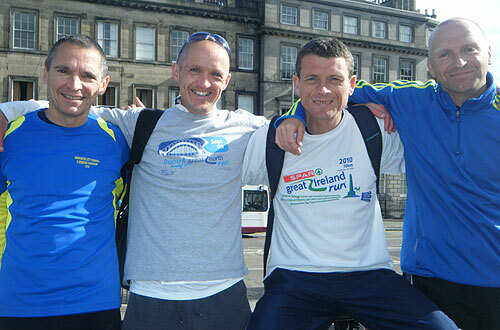 Tyne Bridge Harriers > Race Reports > EMF 2011: Deka Rips Up The Rulebook! Deka rips up the rulebook! The day before any marathon, each competitor tries to get their mind-set just right. You review your preparation, focusing on all of the positives and try to convince yourself that your targets, set some time before, are realistic and achievable. You have worked hard and spent a long time putting in the miles before carefully tapering off and looking after your body. You want to be in the best shape possible on the day of the big test. In the car on the way up, DD and myself agreed to be positive when talking to Deka. He needed all the help he could get, we thought, to even finish the race. He talked of ducking under 4 hours. I told him that this would be a tremendous achievement. I still thought he had no chance of even finishing. I was worried about having to wait for hours to find him after the race had finished! David steadily built up a lead on me from about 3 miles into the race. I managed to knock of the miles at a consistent pace of between 6:38 to 6:48 for 18 miles. I next saw David when I was at about 18.5 miles and he was on the other side of the tape at 19.5 miles. He must have been the best part of 7 minutes ahead! He was having a phenomenal debut at the marathon! “Go on David!” I shouted. I reached 20 miles having averaged 6:43 pace and then my legs became heavy, as they had done last year. 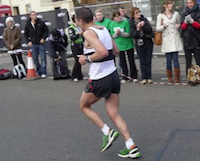 This time, however, it was not a shock, I knew I had to ease the pace and, most importantly keep running. Whilst my pace dropped to between 7:30 and 7:45 per mile, I managed to keep running. By now the wind had really increased and it was gusting into our faces. It was HELL! I was counting the miles off one at a time. I did look for Deka on the other side of the road. There was no sign of him. “He must have dropped out,” I thought. As I passed the 26-mile marker I heard Catherine and Gareth shouting their support. 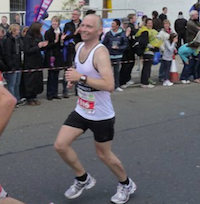 Another person shouted, “Your team-mate’s just around the corner.” David had also experienced the strange sensation of the legs turning heavier than you can imagine unless you’ve ever run this distance. He recorded a brilliant time of 3 hours 2 minutes and 48 seconds. I finished ten places behind in 3 hours 3 minutes and 29 seconds. We had both missed out on the sub-3 hours we had hoped for but we were both content with the performance in difficult conditions. To be honest, I think that I would have been very close to 3 hours in better conditions but I wouldn’t have quite cracked it, David may have done. A few minutes later, there was Deka… He looked so fresh that I assumed he had dropped out at around 11 miles, which is near to the eventual finishing line. “3 hours 24”, he said. “What, you’ve done it in 3 hours 24 minutes?” I gasped. Deka had a huge grin on his face and looked like he could go off and run it all again! A special mention to DD who knew, 6 weeks after recording a club-record of 2 hours 50 minutes and 1 second, his body was not ready for another marathon. He drove me and Deka all the way to Edinburgh and back. He also did his best to support David Appleby and myself in the first 6-7 miles running alongside us and encouraging us. Thank-you David – Double Diamond! brilliant performance guys in difficult conditions. and dekka – the stuff of legends, man! Well done lads, excellent runs- 3PBs in tough conditions. There were some lovely facial expressions at the 25.5 mile point after 8 miles into a hurricane! Good for age standard for London 2012 is now 3.10 for 18-49 men, no longer 3 hours. Enter before 15th July!! London is surely a faster course than Edinburgh- more shelter, bigger crowds and more faster runners to pull you round, go on, you know you want to do another one. Deka, you might have found your ideal distance, think what you could do with some actual marathon training! well done lads.. superb running.. really proud of everyone.. Fantastic achievement Deka considering that you only decided to do it the day before.. seems fitting that the inspirational quote on the TBH website today is from Walt Disney… Deka.. it certainly was a Micky Mouse idea but as Walt says “All our dreams can come true, if we have the courage to pursue them.” well done again everyone. Great report Sean and as I have said elsewhere great respect for Derek for turning in a performance like that the man is a legend. in all my years of running, some at a decent level, I have never experienced anything like the the sensation I felt at 21 miles, the mind was willing but the body wasn’t able. The headwind didn’t help but I wouldn’t blame it, this was down to my body suffering. The deterioration came without any significant warning then bang I was gone. I have checked my Garmin download and the last 5 doesn’t make good reading. Still enjoyed it and am looking forward to London next year. The good for age 41-59 is 3.15, sub 3.10 for 18-40 slight correction to Gareths post. Cheers to Gareth and family for the shout out and I have seen the photos for the finishing straight and they are not pleasant. Dave, Dave, Sean well done. Nothing you can do when the elements conspire against you. Within touching distance of 3hrs…next time for sure.